Winston Liu, BS, Duke Univ. 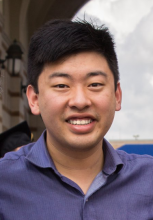 Winston Liu, BS is an MD/PhD student at the Duke University School of Medicine. He graduated from the University of Maryland in 2015 with a degree in bioengineering. He recently joined the Bohórquez Laboratory for his PhD training, and he is dissecting a neural circuit that transduces sensory cues from gut luminal microbes to brain areas that control behavior. During his first two years of medical school, he helped to develop a personalized music listening program for assisted living residents with dementia. Winston aims to become an independent physician-scientist focused on the interactions between our mind and other organ systems.